Download "LPS Security Timeline and History"
3 programs were created and then utilized by law enforcement officers. LPS was credited with developing the first program for the first Pocket PC, the Cassiopeia Pocket PC. 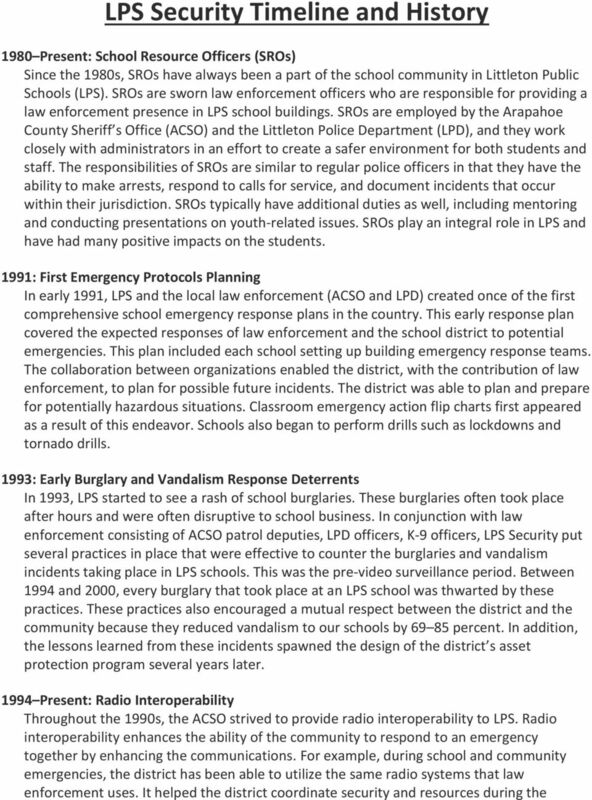 4 2002 Present: LPS Integrated Security System In 2002, ACSO and other community partners helped plan and design the district s integrated security system. At the time, LPS was one of a few school districts who had plans for such a system. The design and cooperation served as a national model, which brought the district much recognition in the security industry. In , the new integrated security systems went online for the district. The systems were built with input from members of the district, ACSO, and other community partners Present: Incident Command System Adopted In 2003, LPS, ACSO, and other community partners adopted the national Incident Command System (ICS). Under the direction of the LPS Emergency Planning and Safety Committee, all LPS schools adopted this system. In addition, each school had to participate in ICS procedure drills. ICS has proved to be immensely valuable in the school district when emergencies have arisen. 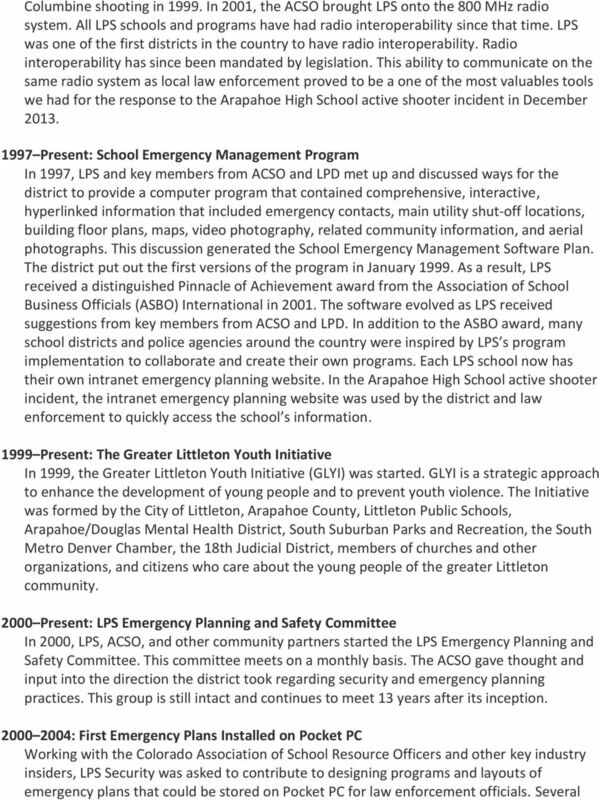 In the Arapahoe Active Shooter incident, ICS was run by the entire district Present: Classroom Emergency Flip Charts In 2003, LPS, ACSO, and other community partners released a new classroom emergency response plan. Classroom emergency flip charts were distributed to all schools and have been updated periodically and redistributed over the years. 2003: Active Shooter and Unified Command Drills The first of many active shooter drills were conducted in LPS schools in These drills consisted police and fire response to simulated emergencies in LPS schools. The district learned how to support the response and about the principals of incident command and unified command : LPS Security Contributes to Wearable, Portable Computers Industry LPS Security assisted several key industry developers in designing first responder technology. LPS contributed the School Emergency Management Planning Software (SEMPS) program and generated many other ideas to improve first responder response capabilities. 2004: District Receives Award for Security Design LPS received a Security Honor Award from Access Control and Security Systems for influencing the security industry. This award was the result of the district s work with law enforcement and other community partners. 2004: Washington D.C. Conference LPS Security spoke with Congressman Tom Tancredo and law enforcement officials on community preparedness in the Littleton area to members of Congress and other government officials. LPS spoke on SEMPS, emergency planning, and how technology could help schools and law enforcement in responses to school emergencies. 5 2004: ISC Security Show in Dallas LPS Security spoke at the ISC Security Show on integrated security in schools. 2005: Security Executive Council in San Diego LPS Security spoke before industry CEOs about integrated security systems and needs of schools and first responders in dealing with school emergencies. 2005: Surviving School Violence Law enforcement started training school staff how to respond to school violence. 2005: School Attendance Review Board LPS Security reached out to community partners, including law enforcement, Greater Littleton Youth Initiative (GLYI), the Binning Family Foundation, the City of Littleton, and the Littleton Immigrant Resource Center, among others, to create a unique solution for school attendance. Members from each agency make up the School Attendance Review Board, a voluntary and confidential authority that works with families to help them get their kids to school every day. The board works out a contract with the family, which is enforced by truancy intervention specialists, who have been known to bang on an absent student s bedroom window first thing in the morning to get them out of bed and then give them a ride to school. 2006: LPS Security Recognized by Security Magazine LPS Security was recognized as one the top 25 leaders the security industry by Security Magazine. 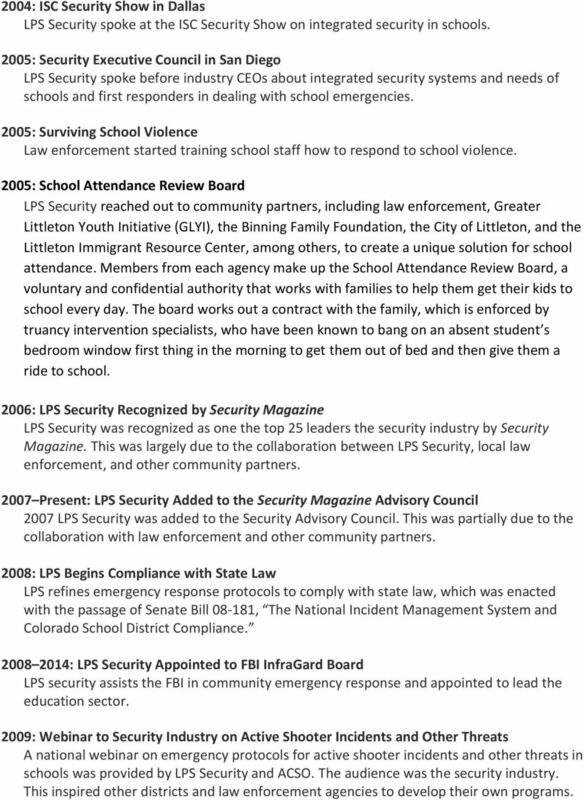 This was largely due to the collaboration between LPS Security, local law enforcement, and other community partners Present: LPS Security Added to the Security Magazine Advisory Council 2007 LPS Security was added to the Security Advisory Council. This was partially due to the collaboration with law enforcement and other community partners. 2008: LPS Begins Compliance with State Law LPS refines emergency response protocols to comply with state law, which was enacted with the passage of Senate Bill , The National Incident Management System and Colorado School District Compliance : LPS Security Appointed to FBI InfraGard Board LPS security assists the FBI in community emergency response and appointed to lead the education sector. 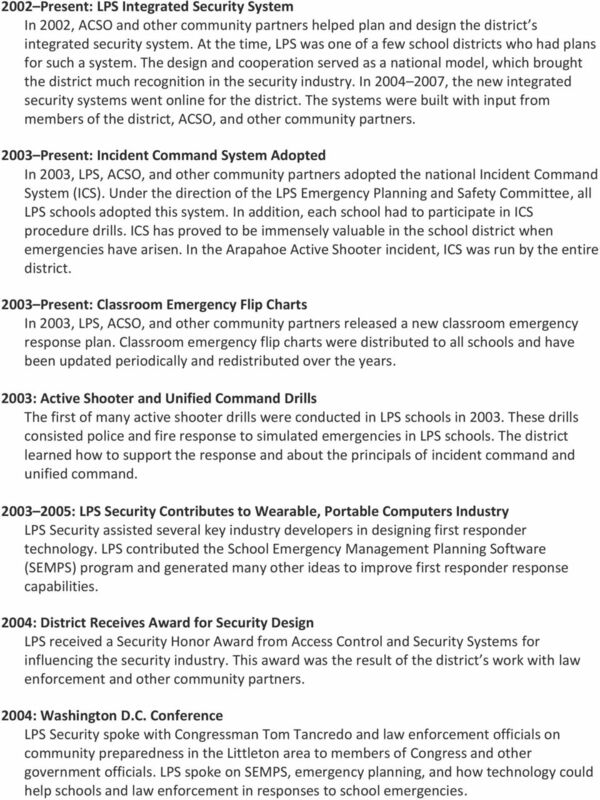 2009: Webinar to Security Industry on Active Shooter Incidents and Other Threats A national webinar on emergency protocols for active shooter incidents and other threats in schools was provided by LPS Security and ACSO. The audience was the security industry. This inspired other districts and law enforcement agencies to develop their own programs. 6 2010: Webinar to Security Industry on Radio Interoperability LPS Security and local 800 MHz providers provided a national webinar on 800 MHz radio interoperability and how schools could work with law enforcement and the government to improve emergency response. 2010: LPS Joins the Red Cross Ready Rating The Ready Rating is a program that helps businesses, schools, and organizations become prepared for disasters and other emergencies by evaluating plans and programs they have in place. Membership also comes with training opportunities, and it allowed LPS to begin training employees on first aid and CPR. 2011: LPS Bolsters Automated External Defibrillator (AED) Program LPS Security obtained a grant from the Red Cross for 32 Automated External Defibrillators (AEDs), which are portable electronic devices that measure electrical impulses from the heart when attached to a patient. The AED will then give instructions to a layperson to apply electrical therapy to restore the heart s effective rhythm. AEDs are now in every LPS facility, and employees are trained on their use, and Security ensures the upkeep. 2011: SEMPS Intranet Websites Go Online All LPS schools have their own emergency planning websites, access to which has also been provided to law enforcement. These websites are great places for first responders and school ICS teams to obtain information from, and since they are intranet-based, they are not accessible to outside entities. 2011: District ICS Plan Redraft Completed The entire district ICS plan was redrawn and adjusted jointly with law enforcement partners. All teams and schools were trained on the new plans. 2012: Physical Security Information Management Webinar to Security Industry LPS Security and other security industry officials gave a national presentation on Physical Security Information Management Systems (PSIMS). This is the direction the district is taking with its security and emergency planning systems. 2012: LPS Security Starts Red Cross First Responder Training LPS Security certified key members of its team to become Red Cross trainers. The security team has trained and certified several hundred LPS employees since the program began. 2012: LPS Security Featured in Security Magazine LPS Security is listed in the K 12 Top 20 and Security 500 in Security Magazine. 7 : LPS Implements Buzz-In at Elementary and Middle Schools Visitor buzz-in was initially implemented in 2012 at elementary and middle schools at the advice of security and law enforcement. The practice enhances the safety and security of staff and students at each site. The program will be refined and improved with the upcoming bond projects Present: How to Respond Basic Protocol Training LPS implemented the How to Respond training in 2013, at the advice of law enforcement. This covered and emphasized lockdown, lockout, evacuation, and room clear. Drills are regularly conducted at all LPS schools Present: Revised Incident Command Plan and Emergency Flip Charts Released With input from law enforcement, LPS revised both the school-level and district-level ICS plans and distributed districtwide. Additionally, new Classroom Emergency Flip Charts were distributed to each school Present: Digital Local Radios Deployed Heritage High School was the first school to migrate to digital radios for local communications. This improvement solved tremendous communication issues in the schools for staff and first responders and was implemented throughout the district. 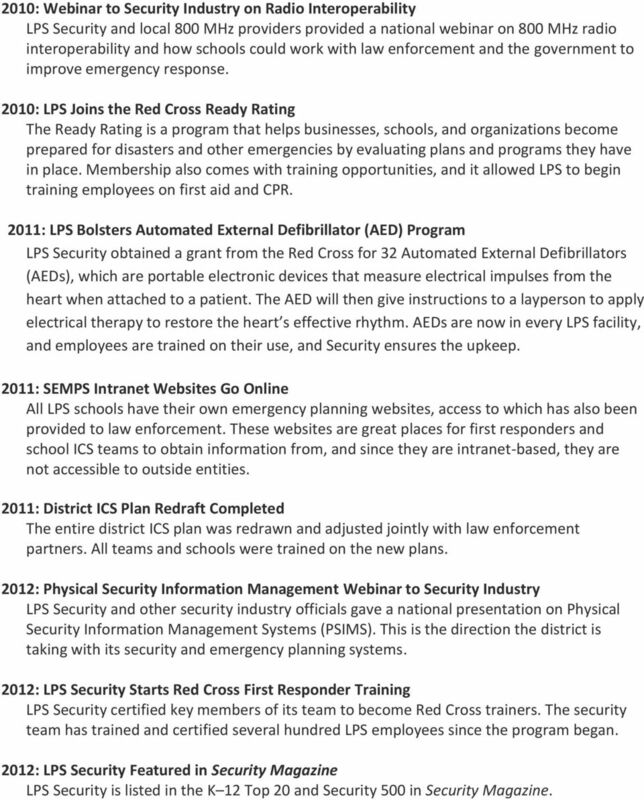 2013: LPS Security Featured in Security Magazine LPS Security is listed in the K 12 Top 10 and Security 500 in Security Magazine. 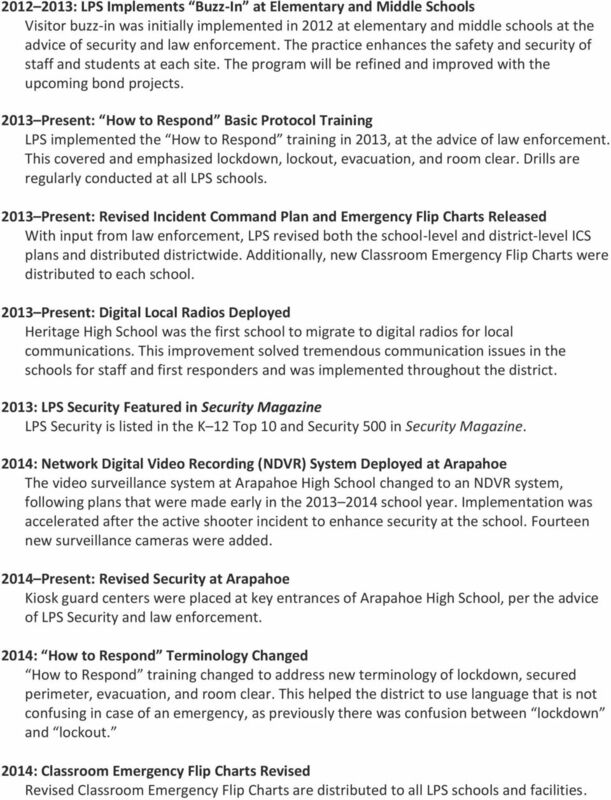 2014: Network Digital Video Recording (NDVR) System Deployed at Arapahoe The video surveillance system at Arapahoe High School changed to an NDVR system, following plans that were made early in the school year. Implementation was accelerated after the active shooter incident to enhance security at the school. Fourteen new surveillance cameras were added Present: Revised Security at Arapahoe Kiosk guard centers were placed at key entrances of Arapahoe High School, per the advice of LPS Security and law enforcement. 2014: How to Respond Terminology Changed How to Respond training changed to address new terminology of lockdown, secured perimeter, evacuation, and room clear. This helped the district to use language that is not confusing in case of an emergency, as previously there was confusion between lockdown and lockout. 2014: Classroom Emergency Flip Charts Revised Revised Classroom Emergency Flip Charts are distributed to all LPS schools and facilities. 8 2014: District ICS Plan and Emergency Flip Charts Revised LPS s ICS plan was redrawn districtwide and updated Classroom Emergency Flip Charts were disseminated. Schools are in the process of learning and training on new changes. 2014: Homeland Security Conference LPS Security was a guest speaker regarding active shooter response at the Homeland Security Conference in Philadelphia. LPS Security gave their perspective on how to respond to the unthinkable. 2014: LPS Honored for Emergency Planning At its 100 th anniversary of the Red Cross in Denver, the American Red Cross honored LPS for the proactive emergency planning practices employed by the district 2014: National Access Control Webinar LPS Security participated as a guest speaker on a national webinar regarding access control and how to improve school security. Law enforcement also participated in this planning. 2014: Security Industry Association (SIA) Best Practices Board LPS Security was invited to be on the SIA Best Practices Board and is working with the security industry, schools, and law enforcement on best practices for school safety. This is a national board. 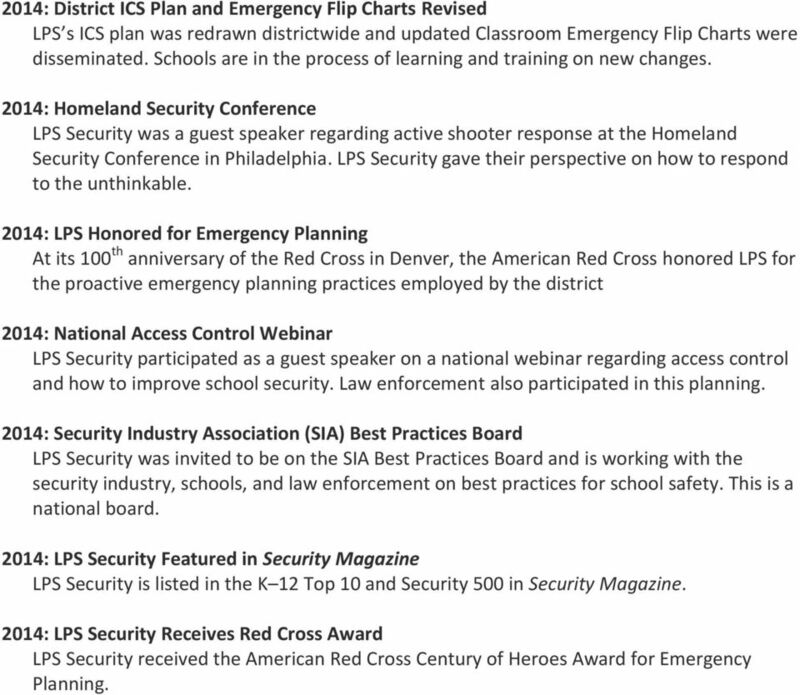 2014: LPS Security Featured in Security Magazine LPS Security is listed in the K 12 Top 10 and Security 500 in Security Magazine. 2014: LPS Security Receives Red Cross Award LPS Security received the American Red Cross Century of Heroes Award for Emergency Planning. Active Shooter Situations Effective Safety Management 3:00 4:00 p.m.
for Schools: Threat Status Alert Worksheet The Green Alert Status reflects a low risk of terrorist attacks. The primary goal of a safe school plan is to safeguard schools against crime, violence and disruption.